References AP_Dialog_CollaborationEditAccount::getAccountHandler(), AP_Dialog_CollaborationEditAccount::m_answer, AccountHandler::storeProperties(), UT_DEBUGMSG, and UT_return_val_if_fail. References AbiCollabSessionManager::getManager(), m_pWin32Dialog, UT_ASSERT_HARMLESS, UT_DEBUGMSG, UT_NOT_IMPLEMENTED, and UT_return_if_fail. References AP_Dialog_CollaborationEditAccount::getAccountHandler(), m_hDetails, and m_hWnd. 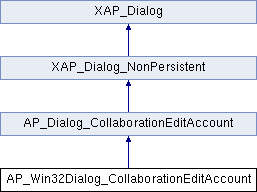 Referenced by _onInitDialog(), AP_Win32Dialog_CollaborationEditAccount(), and runModal(). Referenced by _onInitDialog(), _populateWindowData(), and s_dlgProc().